Rated 4 out of 5 by kraymin from What's not to like, I'll tell you First things first...I thought the graphics could have been a lot better although that doesn't really take away from the game. I also thought the bonus chapter ended rather abruptly and it felt kind of rushed. This 4 star game is still a lot of fun and I felt the HOP's were all good and a little tough which I like. I recommend this game to experienced gamers more than first timers. If you're new try the Maze series first to get a good feel for what a good HOG is truly like and what they are about. I liked the level of challenge as it was fun but not too tough that it made the game too hard to play. Rated 4 out of 5 by steve_san from Night Terrors - this time, its not just hype It seems to be the latest gaming fashion to include warnings like, "Disturbing images, unlimited terror, scary beyond your wildest imagination" and the like, but this time they actually may apply. There is some weird and creepy stuff going on right from the opening videos, and the warnings shouldn't be easily shrugged off. The story is sketchy, something about an archaeologist discovering an obelisk and an evil spirit being released - one which can only harm you if you fall asleep. Don't fall asleep! There's more but you can probably guess most of it. And of course, "you are the only one" who can set things right, etc. The atmosphere is dark, dreary and decrepit and the colors are drab, dull and diffused (ok I used up all my d's).The voices are mostly good, but I thought some of the acting was a little over the top. As a personal touch, your player name is inserted into the story in a couple places. I'd like to see this in more games. Game play is pretty standard; opening locks, sharpening knives, replacing missing items and, yes, there is a zipper pull. 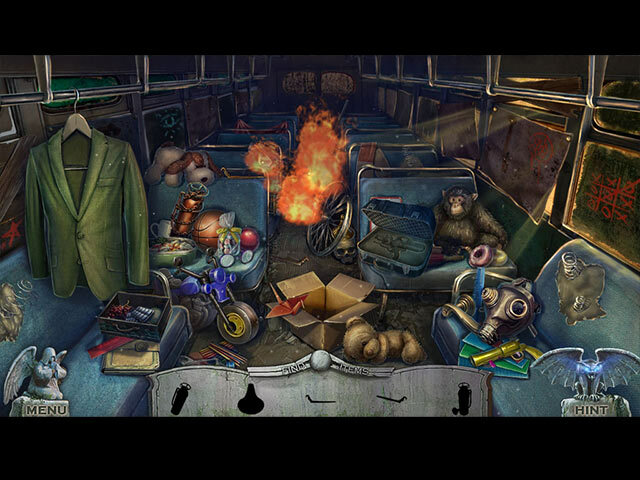 There are 15 puzzles and 20 hidden object scenes. During the trial the puzzles were fine except for one. This was a very tedious sketching of a picture with chalk going from dot to dot. It didn't matter where you started, you just had to complete the picture. I thought this was a waste of time. On the plus side, there is a video game called Grave Racer which is played on the cell phone in the game. The hidden object scenes were much better, not all are the usual piles of (starts with "j"). They require interaction, a sharp eye and a little imagination. This CE version is lacking in extras. Collectibles only consist of 12 figures (the game page does say these "earn bonus puzzles"). The other usual stuff is there, bonus level, strategy guide, replay of puzzles and HO's and the pseudo extra stuff like wallpapers, screensavers, music and artwork. 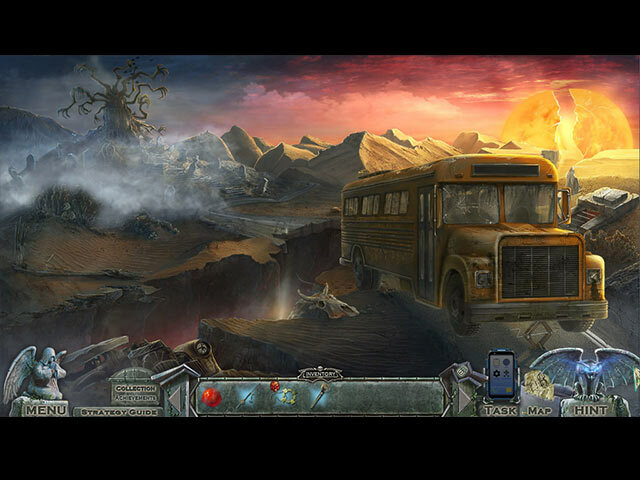 There are four difficulty levels including Custom and a transportable map. I finished the trial with 41 minutes remaining but there seems to be a lot of play to follow. I enjoyed the game so far, but I'm not sure if the Collector's Edition is worth the extra $$. No need to boost the terror, but I may have given 5 stars if they had boosted the extras a bit. So you may want to risk falling asleep on Night Terrors until the standard version is released. But then, will there be someone there to wake you in time? Rated 4 out of 5 by pennmom36 from you're getting sleepy, very sleepy......WAKE UP! It may seem a bit excessive to use defibrillator paddles on a patient just because he fell asleep, but Dr. Jane Warovski knows she must go to extremes to keep her patients awake, or they may very well die! Following in her grandfather's footsteps, at the Dream Research Institute he founded, Jane knows all too well what will happen if any of her patients fall asleep. Project Mara began as a simple sleep study to allow scientists to learn the significance behind human dreams, and her grandfather discovered a way to enter people's dreams. Something went horribly wrong however, when a virus began spreading from patient to patient through their dreams. In advanced stages, the virus began to kill it's host, and Jane realized that the only way to keep her patients alive, was to keep them awake, wide awake! Redemption Cemetery games tend to be a hit or miss kind of game, in my opinion, it's because their games are always stuck in the past. The handdrawn graphics are beautiful, but when compared to the technologically advanced computer generated graphics of today's games, they don't stand a chance. Another problem they have is that their stories are stuck in the past, the time era is always stuck in the past, and they never seem to try to introduce new features. It's difficult to make a connection with the game, all 9 games blend together because they are all about the same. I am a little confused about how this game relates to the jest of the series, Redemption, which usually involves someone going back in time to right the wrong that is keeping souls restless. not at peace. Perhaps it will be Jane that corrects the mistakes of her Grandfather, but usually this is made quite clear within the Redemption Cemetery demo. This Collector's Edition has the usual Achievements to earn, which are awarded in Bronze, Silver and Golden skulls. There are 12 Collectible Character figurines in four different categories, At Death's Door, Clock of Fate, The Island of the Lost, and Bitter Frost. You are equipped with a Smartphone which allows you to view your tasks, etc. and there is an app on the phone to play an archaic driving game called Grave Racer, which also has an achievement tied to it for earning your current best score. 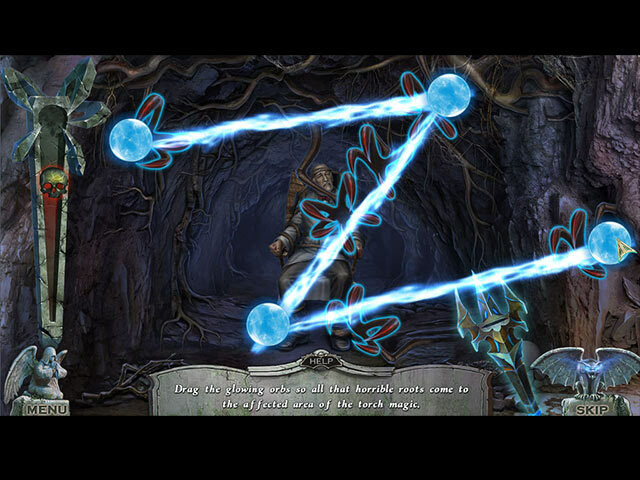 The Hidden Object Scenes have not changed much in the past nine games and will probably always stay the same. They aren't necessarily bad, just typical and predictable Interactive List finds with an interactive puzzle to solve, but there was also a Silhouetted Shape HOP offered in the demo The feature I loathe the most is that they always have a repeat HOP in the same scene. The Mini Games are okay, some super simple, others a bit more frustrating. Below are brief descriptions of some of the games you'll encounter during the demo: 1) Figure out the last 2 digits of the keypad by trial and error. 2) Recreate the symbols shown in the center by choosing two different shapes to combine. 3) Switch between cameras to find someone who has fallen asleep. 4) Arrange the colored balls so they match the pattern shown. 5) Use directional arrows to scan for a virus on a microscope. 6) Match identical x-rays. 7) Use a partial encrypted clue to figure out the pass code. 8) Restore the image by correctly placing puzzle pieces. 9) Rotate tumblers so the symbols match the clue you found. 10) Replace two parts to collect a circular puzzle piece. 11) Select correct combination to get the adrenaline serum. 12) Match all of the cards until only one remains. 13) Complete the image by connecting the dots. This Collectors Edition has 15 replayable Mini Games, 20 replayable Hidden Object Scene, 10 Concept Art pictures, 10 Wallpapers, 7 Screensavers, 6 Music Soundtracks, 21 replayable Movies, 16 Achievements to earn 12 Collectibles, a built in Strategy Guide, and a Bonus Chapter, enjoy! Rated 3 out of 5 by kendiara from Not a lot like the rest of them Nothing like the rest of the series in terms of fun, length or technical functionality. 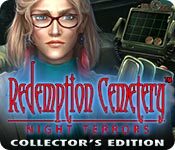 Redemption Cemetery has a theme, you crash into a cemetery and help ghosts. There is one ghost here who plays a nominal role in most of the game, and is not looking for redemption or to have their life re-worked for a better afterlife. The game feels significantly shorter than the rest of the series and has (for me anyway) a serious bug where the game will freeze (normally when opening a box or container) and the sound simply buzzes loudly in your ear until the game figures itself out and allows you to continue. Exiting and starting the game up again helps but it never stopped it completely. That said, its not terrible, but does not in any way measure up to the ones that came before it. Feels phoned in. Rated 3 out of 5 by gobaba from It Was Meh Based on main & bonus games Despite being touted as an ERS game, the dev was identified as AMAX Interactive. Dunno why. The story was a bit jumbled, but I don't follow stories closely anyway. The adventure challenge, puzzles and HOs were okay, nothing innovative or new. Too much chatter for my taste, though others may disagree. Lots of keys & zipper pulls. There are achievements & a few character collectibles. Collect them all and you get bonus HO games. It has the usual CE bling. The bonus game carries the main story a bit further. Main game is about 4 hours in "no skip, no hint" mode, and bonus about 1.5 hours in same. Is it worth a CE? Not really. Unless there's a half price sale. It's just not that compelling. Rated 3 out of 5 by Granny_Gruff from Thank Heaven For Reviews Another Redemption Cemetery game has landed and the story is more obtuse than usual. Luckily the other reviewers and the game notes tell you what the demo doesn't. College friend Jane has called for your help, even though she did not believe in your work with spirits. You arrive to a dark foreboding building with a lighting caused fire outside and the main gates locked. Once you get inside it is to find Jane relieved to see you and locked in isolation. You will be given files of information about people, but it is not clear if they are to be rescued, old patients, or just random info to go with the collectible statues you find. You do see and are threatened by a shadowy dark creature. He seems to think you will be one of his victims. Good luck! Good stuff: I like the style of the artwork in these games. There are those collectible statues, CE bling, and the game elements you expect in these games. Bad stuff: While you travel to another reality using the soul sphere from one of Jane's patients, it is hard to see how this will tie into the main theme of the RC game series, saving the souls of already dead people. Nothing but the story is outstanding here and the story stands out for the wrong reasons as being muddled and dreary. I will revisit this game when the SE comes out or there is a stellar sale. Right now I'm not drawn by the story and the rest of the game is too average. Please try the demo for yourself and see what you think! Rated 3 out of 5 by cutter1 from Just so-so Definitely not the best in the series. Disappointed in the blatant differences between the demo and full version. For example, the HOPs don't repeat in the demo but lo and behold they do in the full (same scene, different list). The demo should be a fair representation of the entire game not a come on to entice a fishie to buy. Rated 3 out of 5 by dancemom1 from Time to retire this one... Hi all! Wow, another Redemption Cemetery. This was was extremely short, so it was a little difficult to really get a feel for the game. They have upgraded it a bit over the umpteen additions in this series. Is it my imagination, or is this a different dev? This does have excellent animation and very nice graphics. The voices are very well done, especially the bad guy. This was the first game I have played that did not have sound when you picked up an item. The sound FX are really nice, a lot of storm sounds of course. This one is set in the same type of place as all the others. I didn't notice music, but I usually turn it way down anyway. HOPs are upgraded, but nothing special. We just have interactive lists and I did not see that we could switch to something else when we got bored. The scenes are fairly clean and items were not difficult to find. Puzzles were painfully simple and took no time or brain power to complete. Help system does give you a hint, but it does not transport to longer locations. This would have been a nice feature to have in this one, as you do a lot of back tracking...a lot. Collectibles were very disappointing. All we have are 12 statuettes of patients in the hospital, which also gives a little bio on each person. These are not difficult to find and are fairly large. Definitely needed something extra here. Not sure how anyone could give this one 5 stars. I liked this series and have a number of the games, but not the last few. The story isn't too bad, but I found that I got bored running back and forth. There is no challenge to this game at all and the lack of nice collectibles makes it not CE worthy. I try to find something good in any game, even if I don't care for it, but I think it's time to retire this one. I'm sure there will be those who really like this one, but it is not for me. I will recommend this game to beginners. As always, try it for yourself and see what you think. We all have different tastes in games and you may find this one to be exactly what you are looking for. Thanks for the reviews. Rated 3 out of 5 by LosAngeHell from My least favorite of the Redemption series Did the original devs on this series die or stop programming? It seems like they ran out of ideas. This version is boring and seems outdated. It seems nothing like the first Redemption Cemetery, which was awesome. Where are the crows? Not a buy for me, unfortunately. Rated 3 out of 5 by Pilot1 from Do not resuscitate! This review is based on less than 10 minutes of playing the CE demo. Why less than 10 minutes? Well, I was so bore by then I just couldn't stand to go on even another minute. I have read the other reviews, and some of the reviewers have my respect and trust, but this is not a game that merits such high praise, nor so many stars as they have assigned. Okay, I'll admit I don't like hand-draw graphics —maybe I've been spoiled by playing too many Eipix games— and these are typical of the type; they are muddy and indistinct. Lip sync is very poor. After the first one or two examples, I just couldn't look at a character's face while they were supposedly speaking. The music is jarring, even at low volume. The ambient sound effects are too strident, even at low volume. The story line was done much, much better in another game. If the name 'Howard the Coward' rings a bell, you'll know which game I mean. The HO sequences were so easy that I completed each one in just a few seconds. The puzzles likewise presented little or no challenge. Although I recommend this game it is with a few huge caveats. If you are an experienced gamer, this game is not for you. If you like crisp, CG graphics, this game is not for you. If you like challenging HOGs and puzzles, again, this game is not for you. If you're buying it for a youngster, despite the built-in violent game warning, or if you're buying it a gift to introduce someone to this type of gaming, well, okay, go ahead, it's your money! Rated 3 out of 5 by campingramps from Not my cup of tea Usually Redemption Cemetery games are pretty good, however, this one left me bored. The story line is weak at best, the characters are unbelievable, and the graphics are poor. I hate dark graphics. There was a "warning" that the game was intense but not while I played. If game developers want their games scary then they need to think of the adults that play them and not the kids. The kids I know that play these would be bored. I don't understand how a game like this can get a 5 star rating. My 3 star is generous to say the least. For those of you who love boring HO's, go for it, everyone else, find something else but, either way, have fun. Rated 2 out of 5 by MissMenagerie from Very limited game time Though the game had a decent story, sound and graphics it was very, very short. The limited playtime resulted in the game not being worth the cost to buy it. Honestly, it felt more like a $2.99 tablet or phone game in terms of play time. Rated 2 out of 5 by mmdgaston from terror indeed tedious to the point of coma inducing. zero storyline....zero. this is a worn out series, and this addition is proof, this series needs to be retired. playing the demo now days is no longer much help.....good luck. Rated 2 out of 5 by shihtzumum from No Redemption Here! Another series gone wrong, used to be one of my favorites. This game makes no sense and when do you get out of the asylum and into the graveyard? The only thing that was to par of previous games is the style of the graphics, other then that, I'm afraid I have nothing good to say. Maybe I'm just too picky. Rated 2 out of 5 by LunaNik from 2½ stars for a promising storyline, but gameplay was ridiculously easy I was hoping for the creativity that ERS displayed in Clock of Fate, but it was glaringly absent in Night Terrors. While the storyline showed promise, the gameplay devolved back to ERS's laurel-resting levels. HO scenes were mostly interactive list, some with a simplistic puzzle like matching pairs. One was a two-level silhouette. Most scenes were visited more than once. Puzzles were overwhelmingly childish. Most involved copying the clue that was right in front of you. That's not a puzzle! It takes no skill at all to move pieces around until they match the picture, or copy a series of numbers off a piece of paper. Matching pairs, jigsaws, and connect the dots? Yeah, I liked those when I was five or six years old. How about some gameplay for adults? Because this was too easy even for beginners to the genre. Rated 2 out of 5 by seeme278 from Adult theme but not adult challenge I only played the demo, but I will not be buying this game. I have purchased most (maybe all) of the previous Redemption Cemetery series, but this one just isn't fun or interesting. It pretends to be more adult by offering a dark theme -- evil spirits invading people when they fall asleep. Feels like its jumping all over the place. You get told to wake someone up, you try three different solutions, nothing works. You get told there's one more chance and suddenly you're in someone's dreams. The puzzles are really easy - and I played in the hardest mode. With such a dark theme, there really isn't any way to enjoy the game unless there is more of a challenge. I'll check in on reviews from players who went beyond the demo, but I don't think I'll change my mind. Rated 1 out of 5 by demfrevr from A waste of money Used to like the series. I was bored from the first 5 minutes. Graphics horrible. Music horrible. Fun factor a big 0. Story line boring. Level of challenge 0. No more to be said.